I normally don’t watch straight-up westerns. Usually, the genre would have to have a healthy dose of sci-fi or horror mixed in to get me interested. That, or Clint Eastwood. That guy’s just awesome. So, it’s rare that I would actually plop down money to go see a straight-up western movie in the theater. It was the matinee pricing, but still. When it came to this remake of the John Wayne classic True Grit, there were two things going for it: it was a Coen Brothers joint, and it starred Jeff Bridges. Still, I held off for a few weeks after it was released…because it was a western. Yeah, yeah, terrible person I am, being all comfortable with my personal movie preferences. How do I live with myself? Anyway, not being familiar with the original movie, beyond that it’s lauded as one of John Wayne’s finest performances, and that he was playing against his usual type of movie character – and that he wore an eyepatch – I really don’t know just how this remake holds up to the classic. Neither do I care. I’m just getting that out of the way, as I’ve had a lot of people ask me if it’s as good as the original since watching this version. I also don’t foresee myself watching the original any time soon. And that’s enough talking about that. Let’s get on with it, shall we? As a whole, I found True Grit to be rather enjoyable, a good way to spend an afternoon with the guys. Good period piece settings, the story kept me engaged with just a bare few minor lagging moments, and it’s gritty without going overboard, I thought. The main thing that made this enjoyable was the cast. 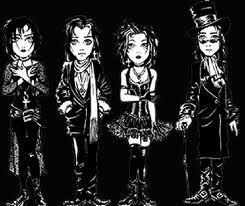 All of them were fantastic, from the main actors down to the very minor characters. Jeff Bridges is a joy to watch here as the grumpy and perpetually drunken Rooster, and whenever he has to go off screen or there’s a scene without him, it makes me sad. Matt Damon as LaBoeuf as the polar opposite of Bridge’s Rooster works well. Very amusing moments with those two together. The big surprise, though, was the performance of Hailee Steinfeld as the 14-year-old with a vengeance streak. Surprise because the actress is actually 14 here, but she gave a much, much more professional performance, holding her own against Bridges, Damon and the other actors that spice up the story. I honestly thought they got a younger 20-something to play the part, until I did a little research after watching this. Very impressive. 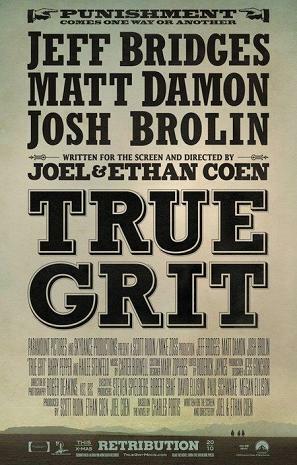 Overall, I found this True Grit to be enjoyable. Good story, great cast. Hasn’t made me want to watch more westerns, but I can think of worse things to do on a weekend afternoon. Twenty-eight years is a long time to wait for a sequel. Especially a sequel to a movie that was considered a box office flop when it was first released. I of course speak of the 1982 movie Tron, a sci-fi flick Disney released at a time when the company wasn’t doing so hot, but was still actively innovative and imaginative none the less. The original Tron was a perfect example of Disney being much more than catering to kids — the effects and production was pretty cutting edge at the time, and the story was a bit darker in tone (something Disney never shied away from, really). Problem was, Tron was released against the soon-to-be pop culture juggernaut that was E. T.: The Extra Terrestrial. Yeah, looking back it seemed like a stupid move, but really who could have foreseen that at the time? Anyhoo, as with a lot of other genre movies, Tron grew quite the cult following over the decades, so much that we finally have a sequel that, in my not-so-humble opinion, not only recaptures the spirit of the original, but builds upon it, giving the world of the Grid a deeper depth and dimension. And no, that has nothing to do with the 3D effects. The story begins several years after the events of the original Tron: Kevin Flynn is telling the tale of his adventure in The Grid to his young son, Sam, before heading out to work on his new creation. It would be the last time his son and the world sees or hears from him again. Flash forward twenty years, and Sam is a somewhat reckless young adult, channeling his inner angst and inherent intelligence and genius to playfully sabotaging his father’s (and his, as he’s also the majority stock holder) company’s efforts to become the next big corporate playa’s. OS / Linux fans will get a kick out of that opening bit, there. After his latest escapade, he’s informed that his estranged father might still be alive, which leads him to the old arcade, where to a soundtrack of vintage 80s rock he’s zapped into The Grid. Immediately he’s taken into the games, and must battle his way out, facing not only a corrupt A. I. master, but also his long-lost father. Oh, and there’s also only eight hours before the porthole between this and the real world closes. And the A. I. wants to conquer the real world as well. So, no pressure or anything. I’m only going to say upfront that, as far as the original Tron goes, I have an appreciation of the film and its impact on sci-fi film history, but I don’t consider myself an ubergeek about it. Not like I am about, say, Star Wars, Star Trek or Doctor Who. I think it’s that kind of low-grade geek appreciation that perhaps allowed me to enjoy Tron: Legacy much more than a lot of others. Overall, I thought that Tron: Legacy was a fantastic sci-fi cyberpunk fantasy, one that immediately drew me in and held me there for over two hours, unwilling to move despite the protests of my bladder. It’s rare that I just lose myself in a movie like that. I’m not saying it’s the greatest movie ever; far from it. I’m just saying that Tron: Legacy provided one of those rare instances where everything came together and worked to that end. There’s a lot I can write about, which has the potential to go on for hours. To keep things relatively brief, I’ll say that I found the plot to be deeper than just the surface points. The father / son dynamic is refreshingly subdued in the angsty drama, where I strongly believed the bond those two shared. There was even a surprising depth to CLU, the A. I. antagonist that, aside from providing the obvious “I’m my own worst enemy” dynamic (if you’ve seen the movie already, you know what I’m getting at…and if you haven’t, that’s technically not a spoiler, so quit whining), there’s a certain flashback scene where you actually start to feel kind of sympathetic for him. Kind of. The acting was great, and the effects were just stunning. 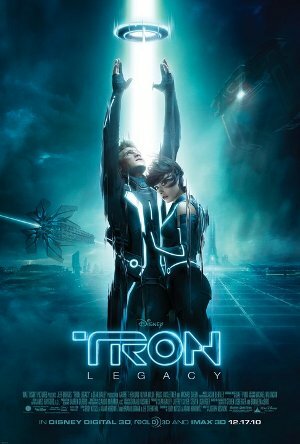 Tron: Legacy is probably the first movie I would recommend seeing in 3D. Which is something in itself, considering my general disdain for what I normally consider an overpriced and unnecessary movie gimmick. In this volatile political climate nowadays, it’s like everyone who has any kind of ties to the entertainment industry considers themselves a political expert, using their “art” as a mouthpiece to voice their opinions on the government and such. There’s a difference between political and social satire and thinly veiled soapbox propaganda. 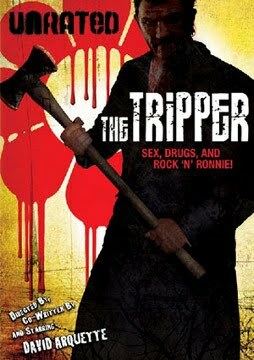 The Tripper falls somewhere between the two. At its heart, the movie is a deliciously raucous slasher flick brimming with dark humor. As writer, director, co-producer and actor, David Arquette has gleeful fun with the material, as any horror geek should. A psychotic maniac mowing down hippies and rednecks dressed up like Ronald Regan — brilliant. Loved it to death (no pun intended). That in and of itself would have prompted me to check this out, no matter who was doing this. The actors chosen for the rolls brought some serious meat to the movie, and not in the “kill fodder” sense. Not a bad apple in the bunch, and everyone seemed to have real fun with the rolls they were given. Jason Mewes plays essentially himself, and that’s a good thing. Jamie King was great as the girl trying to escape her past and trying to stay sober in the middle of the drugs and craziness. Thomas “The Punisher” Jane was a great choice as the local Sheriff, as was Paul “Don’t Call Me Pee-Wee” Reubens as the show promoter. I should point out that the majority of the movie was shot on location in the redwood forest, during an actual festival held there, which resulted in some really beautiful scenery. And the contrast between this and the brutality of the kills is very effective. And kudos on taking the time to build up the characters to make ’em more than just redshirts. As far as the political soapboxing — well, it’s there, but there’s little of it, and taken care of at the beginning. That’s what I was worried about, having to sit through a bunch of Bush hating bandwagon crap. But no, outside of the “Bush is the worst President!” whining at first, followed by a shot of rednecks gushing about how great Bush is, the political sentiments are more tongue-in-cheek. Really, the only character I found annoying (besides the hippies; you can bet I was cheering their demise on with gleeful abandon) was the ex-boyfriend of Jamie King’s character –basically stuck in 80s Wall Street mode, with a license plate that read REDS8TS and toting a pistol because he loved Charlton Heston. And he was abusive. Imagine that. Further proof that the world we live in is slipping deeper and deeper into Bizarro Land. The past few years, Warner Bros. has released such direct-to-video fare as Lost Boys: The Tribe (*grrrr*) immediately, not to mention a lot of less-than-memorable theatrical features, and let movies like this one languish for over 2 years before releasing it on DVD almost as an afterthought. Me am not Bizarro NecRo, goodbye. For the past couple of years, I’ve kept hearing about this movie. Websites and message boards were gushing about Trick ‘R Treat, how it captured the fun horror spirit of the classic EC Comics and especially the first Creepshow movie. The buzz was surrounding this movie. And wouldn’t you know, the Brothers Warner (and their sister Dot…HA!) kept promising to give it a theatrical release, but they continued to push back the release date. 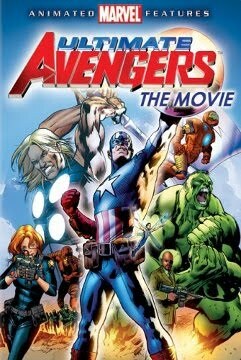 Until finally they recently decided to just put it out on DVD. And if it weren’t for the online horror networks I regularly peruse, I would have missed it entirely. So now it’s out. And while I’m usually a patient man, and can wait until a DVD is in the cheaper rental section, I immediately rented the sucker (I had some credit to burn at the rental place, anyway), and it was with a cautious anticipation I pressed play on the DVD player. Approximately an hour and half later, after the final credits rolled and the DVD reverted back to the main title index, I sat there thinking this was some bloody awesome horror watchin’. A really fun Halloween-themed roller coaster ride this is, featuring four individual vignettes taking place on All Hallows Eve and subtly intertwining, loosely tied together by this cute little spawn of Samhain named Sammy in the credits. Really, this “Sammy has the potential to become one of the great modern horror icons, along side Jason, Friedie, Michael and the host of others. 10. You were rooting for the vampires in “From Dusk Til Dawn”, “Lost Boys”, etc. 30. You own even 1 Projekt C.D. Alright, let me tell you, this movie is one heck of a low-budget heavy metal horror ride. 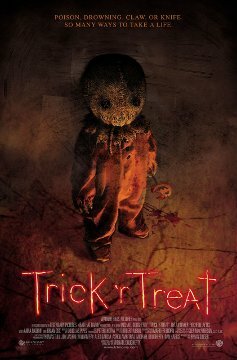 I’ve seen copies of Trick Or Treat on DVDs sold at Wal-Mart for $5. 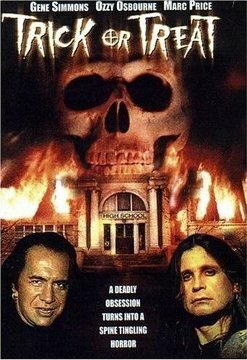 Although the cover art is a bit of a misnomer- metal icons Gene Simmons and Ozzy Osbourne are both pictured prominently, when they only have bit parts in the movie (the rock DJ and a televangelist, respectively). You would be remiss not to check this quaint cheeseball out.